To purchase a copy of the current issue - CLICK HERE Back issues are available from No 1 (published in 1977) onwards. For full details and to purchase a copy if required - CLICK HERE. The BIOS Journal is published by Positif Press, 130 Southfield Road, Oxford OX4 1PA. A full alphabetic index to Volumes 1-15 is available directly from the publisher, Positif Press. 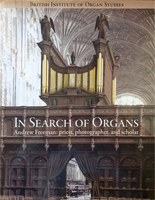 Hardback 308 pages 234 full-page photographs of important and historic organ cases, including some destroyed 1939-1945. Contributions by Nicholas Thistlethwaite, Christopher Kent, James Berrow, Andrew Hayden and Katharine Pardee. Edited by Katharine Pardee. List price 40 pounds BIOS website price 35 pounds. CLICK HERE to buy. 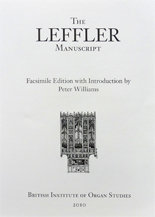 A unique collection of stop-lists compiled around 1800 and attributed to Henry Leffler. The last few copies of the facsimile hardback edition are reduced to 25 pounds plus postage - CLICK HERE. 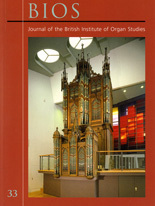 A quarterly newsletter, free to BIOS members, containing news of BIOS activities, newly-awarded Historic Organ Certificates and short articles and research notes. Not available for general sale.